Ritmo Blogger Template is free magazine blogger template adapted from WordPress Theme to Blogger Template. Template features : 2 columns, right sidebar, magazine style, featured posts, elegant slider menu, dropdown menu with red background, social bookmarking icons ready on sidebar, 3 footer columns, tab view menu ready on top, rounded corners style and more. This template suitable for all type of blogs. 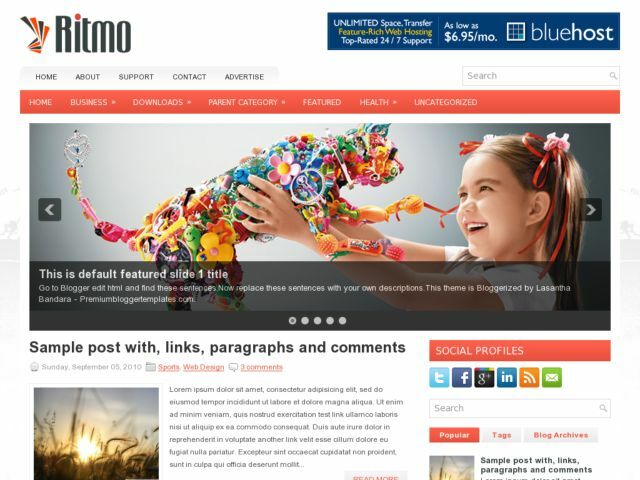 Download Ritmo Blogger Template at Blogger Templates Gallery.